(Nanowerk News) From detecting pathogens in blood samples to the study of protein synthesis, Quartz Crystal Microbalance (QCM) sensors have many uses in modern biology. In this technique, antibodies anchored to gold electrodes on a piece of quartz crystal act like the "hooks" on the sticky side of a Velcro strap, grabbing molecules of interest as they pass by. The more molecule-sensing antibodies on the surface of the sensor, the more sensitive the QCM device's detection capabilities. Unfortunately, some of the antibodies typically anchor themselves to the gold plate "hook"-side-down, rendering them useless as bio-receptors and dampening the sensor's sensitivity. Now researchers from the University of Naples "Federico II" and the Second University of Naples in Italy have found a way to increase the number of right-side-up antibodies in this well-established molecule detection process – using light. 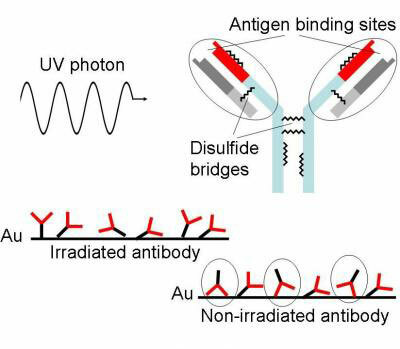 One UV photon is absorbed by the antibody and the disulfide bridge is opened, thereby forming thiol groups. Their interaction with the gold surface leads to an oriented Fab region so that the upside down position (circled in the right side of the picture) is hampered and the antigen binding is more effective. In a paper recently published in the Optical Society's open-access journal Biomedical Optics Express, the team of scientists irradiated antibodies with ultra-short pulses of ultraviolet (UV) light ("Light assisted antibody immobilization for bio-sensing"). The UV light is absorbed by the amino acid tryptophan, which breaks the disulfide bridges holding parts of the antibody together and causes a particular part of the amino acid cysteine, called a thiol group, to become exposed at the tail end of the antibody. Because thiol groups are more strongly attracted to the gold electrodes than other parts of the antibody, the bottom sides of these irradiated antibodies become much more likely to adhere to the gold electrodes than the "hook" ends. Using this method, the researchers were able to more than double the sensitivity of the QCM device, opening up new possibilities for research using this type of sensor, the researchers say.